The Callcentric Android app allows you to use your Android phone to place calls worldwide from your Callcentric account, and save significant money over cellular carrier calling rates. This is particularly useful to customers who want to save money on international calls, or want the caller ID of their Callcentric account to show up on outbound calls they place instead of their Android phone number. Please be sure to read additional helpful information below before configuring the app, and additional ideas for using it at the bottom of this page. After downloading the app to your Android phone and configuring it (see below) you're ready to start calling. The app works similarly to our Click 2 Dial feature, but is easier to use when on the road or not in front of a computer. When you place a call from the app you will first receive a callback to your regular Android phone number, and when you answer your phone you will be connected to the party you dialed. This is typically known as "callback" where you are first called back, and then connected to the party you dialed. Because you are called to your Android phone over the traditional phone networks and then connected with the party you dialed, this can also help if you're in an area with no Wi-Fi and/or poor internet quality. You may also enter any phone number in the "My Number" field when configuring the app (see below), and have the app call you on another phone first (instead of your Android phone). The Callcentric Android app uses data to communicate with the Callcentric network. CDMA network based Android phones (such as those on Verizon / Sprint 2G / 3G networks in the USA) don't support using data (2G / 3G) and voice simultaneously unless you are connected to a Wi-Fi network. Because of this, CDMA based Android customers may have difficulty using the Callcentric app, especially if you are using it while not connected to Wi-Fi AND while in a 2G (1XRTT) data coverage area. If you already have a Callcentric account please skip to step 2 below. If you don't already have a Callcentric account, you can open a Callcentric account here. Callcentric App from the Android Market. Once downloaded to your Android, launch the app on your phone. Select the region your Android phone number is in (or the number you are entering in the "My Number" field below). If it is in the US/Canada or another North American country which has a country code of "1" select "US/Canada". If your Android phone number is anywhere else in the world, select "International"
Enter your Android phone number. This is the number people regularly call you at to reach your Android phone. Alternatively, if you want to be called at another number, enter that number. Enter the username you use to login to the My Callcentric website. Enter the password you use to login to the My Callcentric website. Once you've done that, tap the Done button. If you don't already have funds in your account balance, you'll need to now add that here: Add funds. Because the Android app will place a call to the number you entered in the "My Number" field first, and then to the number you chose to dial, you need to have funds in your account to cover the costs of these calls. Once installed, whenever you attempt to dial a phone number in any app, you will be prompted for how you would like to place the call, including via the Callcentric App. In many places around the world you can obtain a local SIM card either for your un-locked Android phone or a pre-paid and cheap GSM mobile phone. In many countries inbound calls to your mobile number are free, and by combining this with the Callcentric app you can place calls back home or worldwide for much lower rates than roaming with your phone, placing calls from your hotel, or even using a locally obtained SIM card. Use it from other phones! You can even set a different phone number than your Android phone number in the Callcentric app, and the number you enter will be called first to initiate your call. For example, perhaps you're staying at a friends house and want to place a call that doesn't get charged to their phone? Simply enter the phone number of your friends home phone in the app, and you can initiate a call that will first ring your friends phone, and then when you answer connect you to the party you want to call, all without your friend receiving any charges on their bill. Even call Callcentric 1777xxxxxxx numbers! Using the Callcentric app you can call any other Callcentric customers 1777xxxxxxx number, even if they don't have a "real" phone number. You can also place calls to other VoIP networks using Callcentric and SIP Broker. 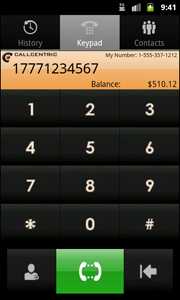 Your Callcentric account balance is always shown within the Callcentric Android app. You can dial manually from the keypad, from your recent call history, or by using the contacts on your Android phone. 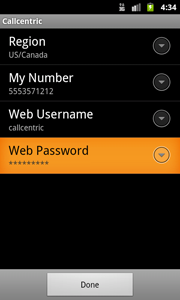 Want to use Callcentric directly over VoIP from your Android phone?